Congratulations for all that you have achieved in your business. We believe, you have ambitions to grow your business further. There are plenty of opportunities in the market, but so are multiple problems. My name is Shivaram. Tanishq was my learning ground for over 10 years. I resigned in 2012 to set up Retail Gurukul to help Independent and Family owned Retailers who wanted to grow and organise themselves. We have listened to, heard from and Coached, Consulted, Trained, Taught over 150+ retailers and manufacturers since then. 1. Profits: How to improve the profits, significantly! 2.Purpose and Plan: How to create a purpose for the business and oneself and how to plan, get organised? 3.Place: How to identify the right location for the store and the right interiors? 4.People: How Consumers should be targeted and how to build relationships with them? 5.People: Staff: How our store staff can make the real difference between our plans and achievement. Recruit, motivate and build teams? 8.Performance Metrics: How to measure the success and missed opportunities and what to do about it. 13.Private Matters: You know them, we help them here too, if asked. In this journey, I have learnt what it takes to be a successful retailer, what are the challenges being faced and what they are capable of but unable to achieve themselves. Typically, we have worked on short and long term consulting assignments with some of the biggest names in the country, like Waman Hari Pethe, Manubhai Jewellers, etc and many more across some 70+ cities and towns. Our clients have benefited quite a bit. Would you like to be benefited too? While we have served the market leaders in the country, we were regularly getting queries from others, as to how we can help them too. Organisations not yet sure of how an external "Consultant" can help them, what exactly are their own challenges and how to solve them? For such people, who wanted to help themselves, I have been conducting Workshops and Seminars across the country, writing articles and blogs on website etc, but the requirements are increasing day by day. Just in the last one week, we have had enquiries from Panipat, Nagpur, Madurai. Some retailers like you have come back and asked, "they need a more long term learning and sharing Gurukul"- not just for one day. Do you want to be part of this Online RetailGurukul? To help you, we want to build an online course for you, the Ambitious Owner. A series of videos, audios which will cover the various aspects of retailing like those mentioned above. You can watch it on your phone, on your computer - Any time, Any where - 24 hours on Retail Gurukul TV, or hear it on Retail Gurukul Radio ( Audio) or read it on WhatsApp. We will have a minimum of over 8 hours of content, spread over a year and have 24 modules at the minimum covering all the above topics and more..
Closed Facebook Group to learn, discuss and network amongst the members. 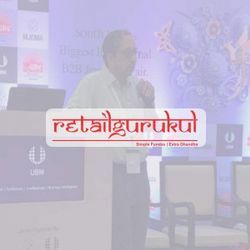 O​ur Regular Full Day "Best Practices in Retailing" workshops are priced at Rs. 15,000 +GST = Rs.17,700 for a year. We are looking for a few early pioneers for this program. Would you like to be that ? Which means, you get to benefit early on ! in this new year. T​his offer has never been made before to anyone from Retail Gurukul.. Ever.